This was so good!! I was a little skeptical because I have never cooked with tarragon before, and when I opened it, it smells exactly like black licorice. I happen not to be a fan of black licorice, so I got nerves about that. Plus, one of the things that interested me the most about this recipe was the fact that the sauce has apricot preserves, Dijon mustard, and hot sauce. So I thought, “Either this is going to be disgusting, or it going to be awesome! !” I’m happy to say that this recipe turned out amazing! The sauce is just, ugh, so scrumptious, and the panko (Japanese-style bread crumbs) becomes so much more crunchy then normal breading. A total must try recipe!! Enjoy! Combine apricot preserves, mustard, and hot sauce in small bowl and season with salt and pepper. Spread flour in a shallow dish. Beat eggs in second dish. Spread panko and herbs in third dish. Pat chicken dry with paper towels and season with salt and pepper. Dredge each tenderloin in flour, dip in eggs, and coat with panko, pressing to adhere. Heat 1/4 cup oil in large nonstick skillet over medium heat until shimmering. Cook half of chicken until golden brown, about 3 minutes per side. Transfer to paper towel-lined plate. Wipe out skillet and repeat with remaining oil and chicken. 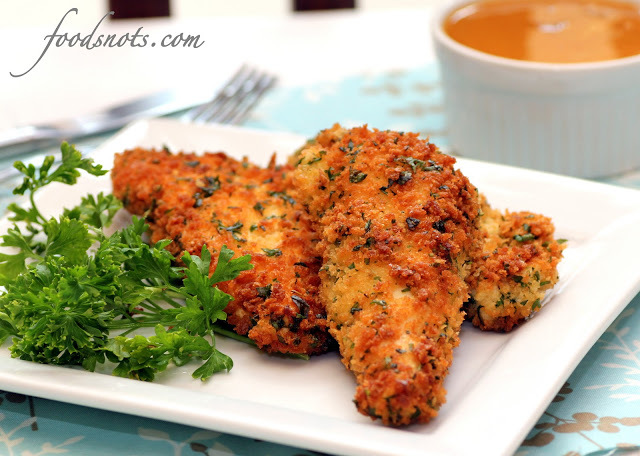 Serve chicken with apricot and mustard dipping sauce.